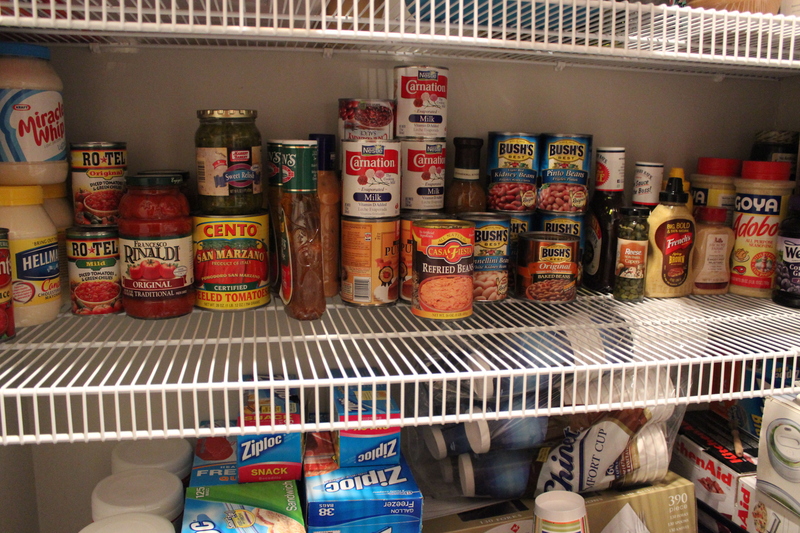 I have been asked several times to make listing of pantry staples. There are definite items that if on hand; you can create an meal and app or a yummy snack. I am going to show you a picture of 1 of my shelves in my pantry – If it was organized better I might share the whole thing with you but – it is not at the moment so trust me you don’t want to see it. – Don’t judge me! I have a favorite grocery store that I do look at their flyer when it comes and if the staples I use are on sale; I tend to buy several to keep on hand. We always have a wide variety of cheeses; Hard, Soft, Sharp, Mild, Stinky – we will try anything once, we did find a yummy soft cheese called Port Salut if you see it, buy it! It is mild in flavor but really yummy! Pasta: Spaghetti, Elbow, Lasagna, Fettuchini, Orzo and Egg Noodles or your favorite shape-You can make just about anything with pasta. Rice: several kinds of rice are great to have on hand, My favorites are Arborio, Jasmine and a brown rice. I also keep boxes of rice pilaf just in case. Instead of water use stock to cook the rice – it adds SO much flavor! Stocks: Chicken, Beef and Veggie stock are always in my pantry, even though I do make and freeze homemade stock; I go through SO much of it I have to keep it on hand. Oils & Vinegars: Canola Oil, Extra Virigin Olive Oil (find one you like the taste of and stick to it) Soy Sauce, Vinegars there are so many and I swear if you have space for them, buy several different kinds to have on hand, Apple Cider, Red Wine, White, Rice Wine are used in so many recipes. I also love having Capers on hand; all you need a a couple of lemons and some boneless chicken and voila chicken picata YUM! Spices & Herbs: Kosher Salt, Black Pepper Corns, you also need table salt and pepper, Crushed Red Pepper Flakes. My all time favorite go to seasoning is Adobo – I use it on Steak, Chicken, Eggs, Fish, Tuna just about anything I can. It’s pretty funny that we discovered it when vacationing on St Lucia many years ago. My favorite herbs are Basil, Thyme, Sage, Rosemary and Chives I prefer fresh but I use dried as well and always have them on hand. I also use Parsley and Oregano For tomato based sauces. There are staples everyone uses, Mayo’s Ketchups, Pickles, several kinds of mustards; spicey brown, grainy, dijon I use them all, they make amazing sauces for chicken and pork. The list is endless but if you can keep a few of the above on hand, you will have a great start to any meal! add some olive oil to a large pot; heat over medium heat; add onion, green pepper and celery; saute briefly. Stir in tomatoes (I tend to crush the tomatoes or cook them well enough to breakdown) and rotel, Add cumin and chili powder to taste and cook for about 6-10 minutes or until veggies are tender. Add the Beans, browned meat and chili seasoning. Partially cover and let simmer for 4 hours. Serve with Cheddar Cheese, Sour Cream and Chives or Green Onions. My family love this chili so much they actually eat it along side cheese omelets in the morning! It also freezes well!! !